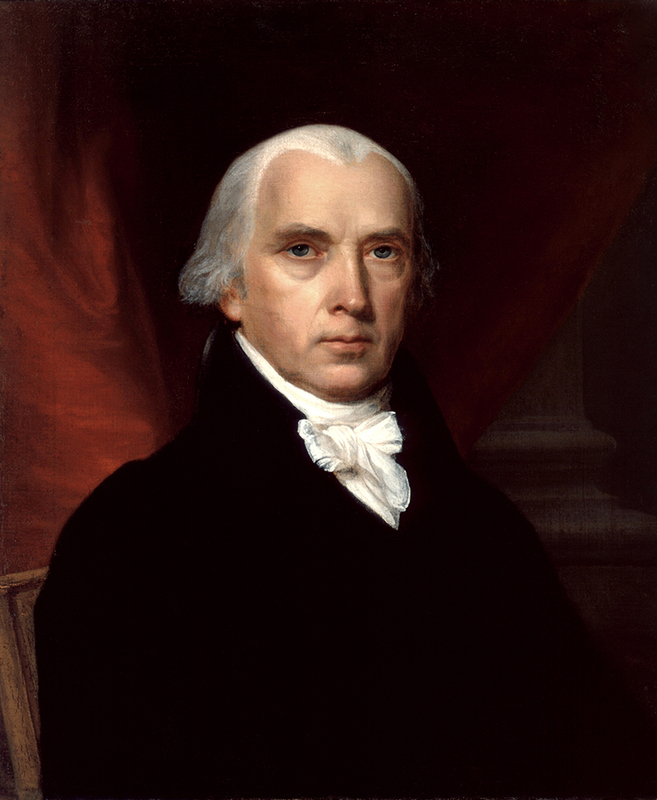 James Madison was the fourth President of the United States and a principal author of The Federalist Papers. Madison is considered by some to be the "Father of the Constitution." James Madison was born in 1751 near modern-day Port Conway, Virginia and lived with his family at Montpelier, the Madison family estate. Madison was well educated, graduating from the College of New Jersey (Princeton University) in 1771. After graduation, Madison embarked on a distinguished political career. A supporter of American independence from Great Britain, Madison was a delegate to Virginia’s first state constitutional convention in 1776. In 1779, Madison was selected to represent Virginia in the Continental Congress. Following the Revolution, Madison played a pivotal role in the creation of the Constitution. He represented Virginia at the Constitutional Convention in Philadelphia, in 1787. At the convention, he promoted a strong federal government, featuring a two-house legislature. Following the Constitutional Convention, Madison played a leading role in convincing the individual states to accept the newly proposed government. Along with John Jay and Alexander Hamilton, Madison published a series of articles, now known as the Federalist Papers, which advocated the Constitution’s adoption. Madison also served in Virginia’s ratification convention, where he was instrumental in convincing his fellow delegates to adopt the new Constitution in 1788. In 1789, Virginia voters elected him to the first of four consecutive terms in the United States House of Representatives. During his first term in Congress, Madison drafted and proposed the first version of what would eventually become know as the Bill of Rights. Initially, Madison favored many Federalist positions, including the establishment of protective tariffs (taxes on foreign goods imported into the United States) to help reduce the national debt. Later, however, he began to distrust the Federalists due to their favoritism toward commercial, as opposed to agricultural, interests. In 1797, Madison left Congress and returned to his home in Virginia. For the next two years, he focused on farming, but he returned to politics in 1799 as a member of the Virginia legislature. When Thomas Jefferson became President in 1801, he chose Madison to be his Secretary of State. As Secretary of State, it was Madison’s task to try to prevent the United States from becoming directly involved in a continuing conflict between the warring nations of England and France. That task was especially difficult because both nations kidnapped American sailors and illegally seized cargoes of American ships. Because the United States was not strong enough militarily to prevent these illegal acts, Jefferson and Madison convinced Congress to enact the Embargo Act of 1807, barring trade between the United States and the rest of the world. In 1808, Democratic-Republican Party chose Madison as their candidate for the upcoming presidential election. Madison easily defeated the Federalist candidate, Charles Cotesworth Pinckney. During Madison’s presidency, tensions between Great Britain and France dominated foreign affairs. Great Britain’s continued infringements on American shipping rights as well as her attempts to inflame Native American relations in the Northwest Territory ultimately forced Madison to ask Congress for a declaration of war in 1812. Congress complied and on June 18, 1812, Madison signed the declaration officially beginning the War of 1812. The War of 1812 proved to be a costly misadventure for all combatants. By late 1814, both Great Britain and the United States concluded that neither side was close to victory. For their part, the Natives in the Northwest suffered from Britain’s inability to provide expected aid in removing the American from lands west of the Appalachians. Rather than continuing a costly war, Great Britain and the United States agreed to a negotiated peace. In December 1814, both sides consented to end hostilities with the signing of the Treaty of Ghent. Each nation kept the land they had owned in North America prior to the War of 1812. While neither side ceded nor gained any land, the war was a political victory for Madison because it reaffirmed the sovereignty of the United States in the eyes of its citizens, as well as the rest of the world. Following his presidency, Madison retired from political life, other than to help Virginia draft a new state constitution in 1829. He spent the remainder of his life as a gentleman farmer, and a slaveholder, at Montpelier, his country estate in Virginia. He died there on June 28, 1836.